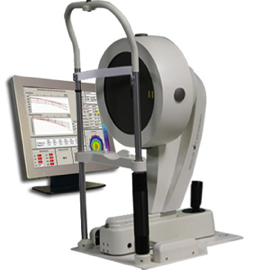 PENTACAM HR The gold standard in analyzing the cornea. 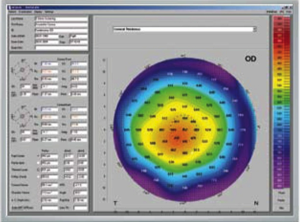 Overview The Pentacam is the gold standard for diagnosis in the anterior eye segment. It supplies topographic data on elevation and curvature of the cornea. The anterior and posterior surfaces are measured from limbus to limbus. 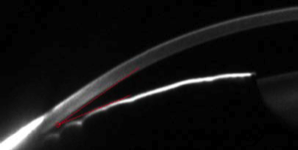 The corneal thickness (pachymetry) is also represented graphically over its entire surface. Very easily we determine the thinnest point of the cornea and all other irregularities quickly and reliably. Using the data on the anterior corneal surface, keratoconus detection is performed. 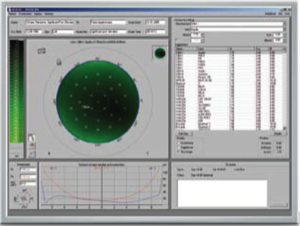 Important parameters such as anterior chamber angle, depth and volume are calculated and represented automatically by the software. After manual entry of the tonometrically measured intraocular pressure (IOP), the corrected IOP value is calculated and displayed taking the corneal thickness into account. The Pentacam provides a comprehensive and completely automatic analysis of the anterior chamber. Immediately after the eye has been examined, the instrument displays whether the patient has an increased risk for glaucoma. Post-operative evaluation of the anterior chamber shows alterations, e.g. after an iridectomy or other surgical interventions. The Scheimpflug images produced by the Pentacam supply a clear representation of lens opacity. The 3D cataract analysis combined with the PNS (Pentacam Nucleus Staging) is a unique feature. The centre of the cornea and its anterior and posterior surfaces are measured very precisely for optimal calculation of the refractive corneal power. For your patients this means a perfect calculation of the IOL power – even after refractive surgery. 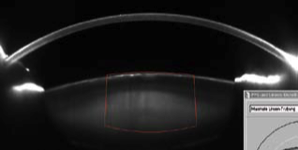 With dynamic fluo image simulation, the fit of the contact lens from the intergrated database can be viewed. The simulation makes it possible to adjust inclination and to shift the contact lens while automatically making a new fluo image calculation. The integrated and expandable data bank contains over 65,000 lens geometries. The contact lens geometries can be adjusted individually in cases where fitting is difficult. The user can establish his own rating list for contact lens manufacturers and can expand the database with new or further contact lenses.